The Wyndywood Worm Farm is combining 2 great initiatives. The Environment and the Health of Women. 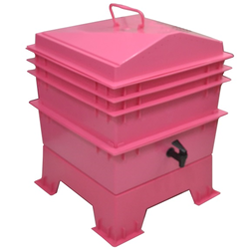 3 tray migrating VermiHut worm farms are the ideal starter worm farm and accommodate all ages. Its size makes it easy for children or the elderly to use and won't become unstable like other farms on the market due to its 1-piece leg system. Perfect to sit under an alfresco area or on a balcony in an apartment block. The perfect edition for all women and their garden. RRP Worm Farms $95.00 but may vary from stockists to stockists. Bokashi kits $75 but may also vary. This price excludes delivery. $5 of every sale from Wyndywood Bokashi bin kits goes to the NBCF.